For a guy like me, who can shrug off bullets and lift seven tons, there's no better profession than powered crime, and no greater burg to practice it in than Gold Coast City. But after ten years of tossing Buicks at heroes I wised up, took the black cape off my back, and hung out a shingle. Only instead of Dark Deeds Done Daily, this one reads Dane Curse, PI. Now I work cases for the dark denizens I was once counted among. The problems they got aren't the kind that cops care about, so I do what I can, because sometimes even the unjust deserve a little justice. At least that's how it was before the world's greatest superhero was mysteriously murdered, an act so terrible it threatens to start a war that'll tear my home apart block-by-block, unless I find the killer in five days' time. But getting to the truth won't be so easy. I'll have to contend with black capes whose powers and pulse cannons can shred my hide. An army of technologically advanced armored lawmen led by a power-mad government schemer. And white caped heroes whose abilities and intentions are both less than pure. No simple task for a small time PI, so I'll need every bit of my strength, guts, and powers if I'm going to find the killer, save my city, and maybe even get some justice for the greatest hero the world has ever known. 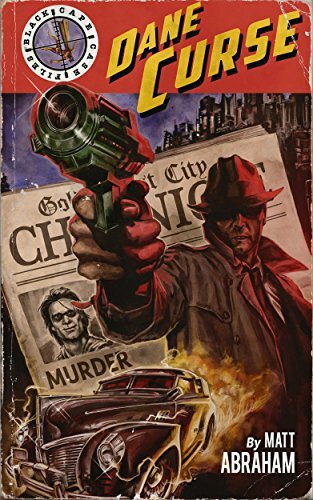 In Dane Curse, Matt Abraham, winner of Pulp Detective's 2015 Newcomer of the Year Award, takes us on our first trip through the powered underbelly of Gold Coast City in a fast paced adventure you'll never forget. If you like white knuckled action, devious dames, and heroic villains then get your copy today, and saddle up with the most exciting detective since Harry Dresden!